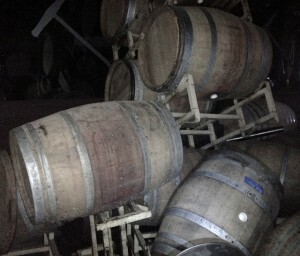 Amongst the devastation Sandy left in its wake after battering the Atlantic coast was a portion of Red Hook Winery’s 2012 vintage, much of it fermenting in open-top containers when the winds and rains breached the winery’s waterfront facing doors and water came flooding in. The first impression from the Red Hook team was not good. With much equipment destroyed, recent renovations in ruins and barrels strewn about, the very future of a singular winery was in doubt. The salt water, one of the very elements from which these predominantly North Fork grapes derive their character, has threatened to destroy them. The crew has fought back, though, and the wines look to be in better shape than first thought — a sure sign that both are as tough as the borough from which they hail. A couple of months before the storm, with the winery in full pre-harvest swing, I had the distinct pleasure of touring Red Hook Winery with its resident winemaker and experienced first-hand just what is so special about this winery and the wines it makes. It’s why I immediately understood the support the winery received from everyone from fellow winemakers (one Piedmontese winemaker, in town on business, came back to the winery day-after-day to help in the clean up) to community groups and wine shops in Sandy’s aftermath. The best way to help and support the winery is to experience the wines for yourself. Below is an expanded version of an article I wrote about Red Hook Winery that first appeared in Long Island Pulse magazine. Photos of the winery post-Sandy throughout are courtesy of Red Hook Winery. Dressed in throw-back running shoes and shorts, Chris Nicolson looks more like a guy about to go for a jog with Prefontaine than what he actually is — which might just be one of the most important young winemakers in New York. He plunges a long glass pipette into a barrel and then offers a sample of the still maturing blend of riesling and sauvignon blanc destined to become the house wine at Momfuku. As we swirl, smell and sip the wine, he throws open the doors at the west end of the winery to the clear blue sky, letting the sea breeze blow in. The water laps at the pier beyond the open doors and the Statue of Liberty looks close enough that you could ding it with a particularly well-hit golf ball. Nicolson exudes a certain infectious, near-manic energy. It’s as if the chaotic work of grapes and yeast, which are furiously changing in the barrels all around us at a molecular level, channels through him and comes out in tumbles of words as he struggles to describe the wines. It’s not that Nicolson is inarticulate; in fact, quite the opposite is true. 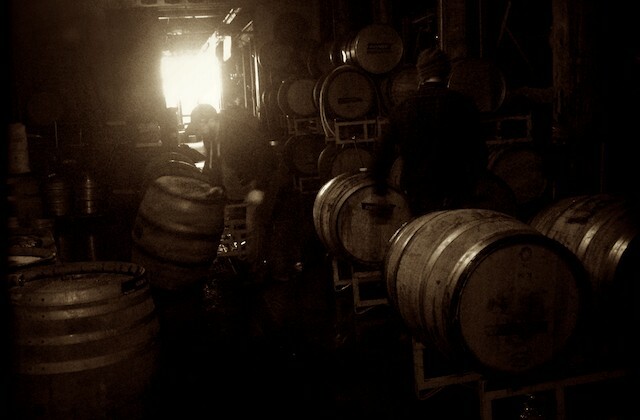 It’s just that the Red Hook Winery isn’t quite like any other and stands out even among the new urban winery trend. For starters there is the sheer number of different wines it produces (though at a small scale — just 750 to 850 cases a year). The overtaxed cellar master at Red Hook has his work cut out for him, keeping track of 64 different wines (or SKUs as they are commonly known in the industry). Then there is the unusual winemaker set up. Nicolson is the resident winemaker, and he oversees every wine — from vineyard to bottle. But then he works with two renowned Napa-based winemakers who have very, very different approaches to winemaking. The set-up is as schizophrenic as it is creative, with the some of the wines produced under the direction of Robert Foley and others under Abe Schoener, both considered among the top tier of Napa winemakers. Each will argue forcefully that his approach conveys a truer expression of the vineyards and terroir, but their methods are at opposite ends of the spectrum, with Foley, a grad of U.C. Davis with degrees in enology and viticulture, taking a precise approach to create very clean, technically correct wines while Schoener, a reformed academic who taught ancient Greek philosophy at St. John’s College in Annapolis, has a more naturalistic tendency that can result in somewhat gnarly (though undeniably interesting) wines. Then of course there is the matter of the grapes coming from 14 different growers — mostly on the North Fork of Long Island, separated from the winery by the LIE and the BQE — to Pier 41 in remotest Brooklyn, where the wines are made. Throw in the three principal partners of the Red Hook Winery, Mark Snyder, Max Loubiere, and Michael Cinque (all of whom have deep roots in the wine business) and do the math — starting with the 64 SKUs and 14 vineyards, adding in the two winemakers and three owners — and you can figure Nicolson is serving many masters (the first, of course, being mother nature and the notoriously inhospitable growing conditions on Long Island). It all has the greatest chance to go horribly awry and yet the wine coming out of this unusual outpost are getting some of the highest acclaim of any wines ever made from Long Island grapes and might hold the key to the region’s hopes for respect on the world wine stage. And the fact that it’s happening in Red Hook, 100 miles from where the grapes grew, is not incidental. I was one of those people with a fixation on Manhattan who didn’t believe that there was anything interesting going on in the outer boroughs,” says Abe Schoener. If he hadn’t changed his mind there might be no Red Hook Winery. All it took was a little change in perspective. He started to come around in 2004 when visiting the Brooklyn offices Mark Snyder, who distributes Schoener’s Napa-based wine label The Scholium Project in New York. It took some urging, but when Snyder finally got him down to Red Hook (this was before Pier 41, but Snyder had an office close by) for the first time, “I was absolutely amazed,” he says. “I was amazed by how close you were to the water. I was amazed by the views of Manhattan.” Even the architecture and stone buildings dating back to the Civil War took him by pleasant surprise. “I was totally knocked out by that.” This became the de facto place where he set up camp whenever he was in New York on business. Which was often. Red Hook at this time began to bustle with new and interesting things. All around them where people blowing glass and bending iron. Soon he and Snyder, so taken with the place, were talking about doing something — they weren’t quite sure what, but something — on the waterfront. While it might have seemed an incongruous place for one, a winery made the most sense for them, even if not geographically. The area, so deep in Brooklyn that the easiest way to get to it is by ferry, was once a hub of basement winemaking. Italian and Jewish immigrants brought their own winemaking traditions. “In Red Hook at the right time of year, you could smell the aroma of fermentation coming from most every home,” writes Schulman of Depression-era home winemaking in her oral history-informed book “Eat This City.” The grapes that those early urban winemakers used came, she found in her research, mostly from vineyards in California. And so they resolved that a Red Hook Winery would be a true New York winery, and that meant predominantly Long Island fruit. By 2007 they were scouting vineyards. “We knew that if we thought Long Island wines were weak, we also knew that we had never done an intensive investigation of them,” says Schoener. That was about to change. Despite the stereotypes Schoener says they found Long Island vineyards that displayed much of what he looks for in California in terms of vegetative vigor and vines in balance, and much higher quality vineyards in general than what the naysayers had led him to believe. Even Long Island’s farming practices were coming along. Graeme MacDonald calls the North Fork “the Wild West” of grape growing. When he says this he’s really excited, as maybe only someone who’s grown up working the monotony of Napa harvests (where near ideal growing conditions change little) year after year could be. MacDonald is a second-generation California grape grower who’s worked with Schoener as a winemaker on The Scholium Project in the past and will soon release the first vintage of his own MacDonald Vineyards wine. Why make wine on Long Island? Well MacDonald may give you the old mountain climber’s answer. Because it’s there. A frontier in winemaking to be conquered. The shifting landmass of the North Fork, essentially a sandbar deposited by a receding glacier, presents a challenging place to grow grapes. But the prospect has long been tantalizing, because there is the possibility of making some very good wines (and then the proximity to New York City also means there is a large local appetite for these wines — after all, without the city of Bordeaux, Bordeaux itself might never have risen to prominence.) 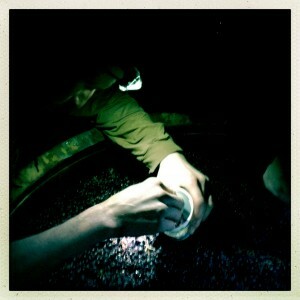 But the very conditions that make it difficult for the grapes to grow might be what gives them their power. The grapes’ struggle to survive produces smaller, and in some cases, more intense berries. The maritime effect gives many of the wines a pleasing minerality and added complexity. 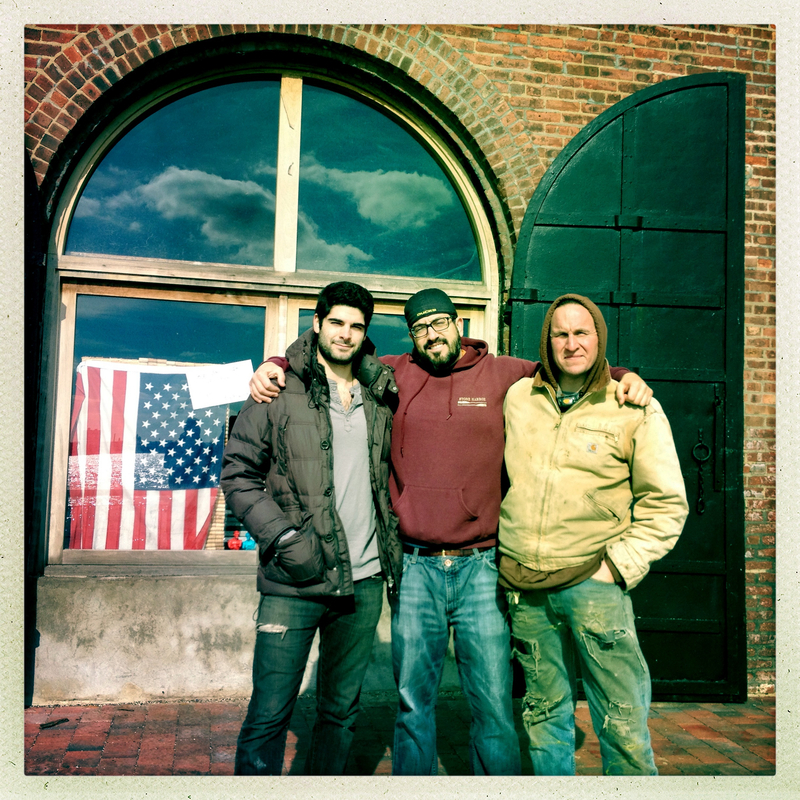 The wines of Red Hook Winery bear the marks of having weathered North Fork growing seasons — from all the great things Long Island can bring (minerality and a downright savory salinity) to the war wounds of epic struggles with rot, mildew and disease that has long plagued the region. Some of Schoener’s Red Hook wines are savage, mouth-filling whites that can almost drink like reds. Some of Foley’s show classic structure and pristine, bright fruit. Walking out of the Red Hook Winery after a whirlwind tasting (you’ll never come close to all 64, but still it’s a dizzying experience nonetheless), the last thing you want is a wine made from California grapes. Though the first thing might be a beer “reset” at the Six Point Brewery around the corner on Van Dyke Street. After that, when your mind and palate wander back to the wines of Red Hook while you peruse a wine list you might find yourself gravitating toward unwieldy old world wines that are born of ancient limestone cellars or wines with names that sound like the curse of some long-dead Eastern European count. There are some people who think that Long Island’s excellence might depend on different varieties than those planted now; Schoener is adamantly not among them. While he points out that many people are doing valuable work experimenting with more esoteric and exotic varieties and he’s glad they are doing it, he’s personally become less interested in that sort of exploration. “Not because I don’t think those are promising,” he says, “but I think that the interesting vineyards that are growing chardonnay, sauvignon blanc, cabernet franc and merlot — in that order — are capable of producing such good wines that I wouldn’t replant or graft them over.” Schoener is especially fond of some of the sauvignon blancs and chardonnays Red Hook has produced, wines he says he’d put against any wines in the world. About this at least, Foley is of the same mind. “The region produces whites that can give white Burgundies a run for it and we’re guiding the chardonnays accordingly,” he says. They may or may not give Burgundy a run for its money any time soon, but these wines are still establishing their identity. 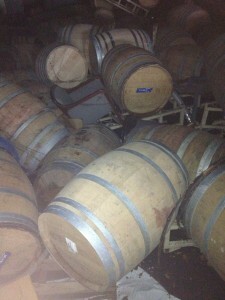 And when we think of what these wines should be, maybe we should first think of what the food from the North Fork is. Historically this was a land of hard-bitten baymen, pulling oysters and shellfish from frigid waters. This might suggest a white wine, one with salinity and acid, the minerality of crushed oyster shells and an indefinable edge — that thing that makes it worthy of being called a New Yorker.